A large membrane proteinase 3 (mPR3)-positive neutrophil subset (mPR3high) is a risk for Wegener’s granulomatosis (WG). The relationship between mPR3 expression and clinical manifestations was investigated in 81 WG patients and mPR3 expression was studied in CD34+ stem cell–derived human neutrophils. The mPR3high neutrophil percentage correlated with renal function, anemia, and albumin at the time of presentation. The mPR3high neutrophil percentage and renal failure severity correlated directly after 5 yr. For elucidating mechanisms that govern mPR3 expression, studies were conducted to determine whether the genetic information that governs mPR3 expression resides within the neutrophils, even without stimuli possibly related to disease. CD34+ hematopoietic stem cells were differentiated to neutrophils, and their mPR3 expression was determined. A two-step amplification/differentiation protocol was used to differentiate human CD34+ hematopoietic stem cells into neutrophils with G-CSF. The cells progressively expressed the neutrophil surface markers CD66b, CD35, and CD11b. The ferricytochrome C assay demonstrated a strong respiratory burst at day 14 in response to PMA but none at day 0. Intracellular PR3 was detectable from day 4 by Western blotting. An increasing percentage of a mPR3-positive neutrophil subset became detectable by flow cytometry, whereas a second subset remained negative, consistent with a bimodal expression. Finally, human PR3–anti-neutrophil cytoplasmic autoantibodies induced a stronger respiratory burst, compared with human control IgG in stem cell–derived neutrophils. Taken together, these studies underscore the clinical importance of the WG mPR3 phenotype. The surface mPR3 on resting cells is probably genetically determined rather than being dictated by external factors. Anti-neutrophil cytoplasmic autoantibodies (ANCA) are found in patients with systemic small-vessel vasculitis (1–3). A pathogenic role of ANCA interacting with ANCA–antigen-containing neutrophils and monocytes was suggested by numerous in vitro studies (4–10). Further evidence for a central role of ANCA as a pathogenetic factor of vasculitis was recently shown in an animal model of the disease (11). ANCA directed against proteinase 3 (PR3) are found in Wegener’s granulomatosis (WG) (12,13). Intracellular PR3 is translocated from granules to the cell membrane upon neutrophil activation. However, some PR3 is also expressed on cell membranes of nonactivated resting neutrophils. It is interesting that the total neutrophil population of a given individual can be divided into a membrane PR3-positive (mPR3high) and a membrane PR3-negative (mPR3low) (14). Although the amount of mPR3 changes with activation, the individual percentage of mPR3high neutrophils is stable during a person’s lifetime and does not change appreciably with activation status or the neutrophil’s age (14–16). A high percentage of mPR3high neutrophils was a risk factor for vasculitis, was associated with relapse in a Dutch cohort of patients wit WG, and resulted in stronger neutrophil activation by PR3 ANCA in vitro in earlier studies (15–18). Thus, a detailed understanding of mechanisms that control this dual mPR3 expression pattern is important. We recently described a strong genetic influence on mPR3 expression in monozygotic and dizygotic twins, where a high within-pair correlation was found only in monozygotic twins (16). However, whether the genetic information that determines the percentage of mPR3high neutrophils resides in the cell or in the extracellular host milieu is not known. The aim of this investigation was to explore the relationship between mPR3 phenotype and clinical course in our WG patient cohort. In addition, we investigated whether hematopoietic stem cells could be differentiated into neutrophils and whether this differentiation would provide a feasible approach to study mPR3 expression and ANCA-induced neutrophil activation. Finally, we tested the hypothesis that the stem cells were innately equipped with the information to generate a mPR3low and mPR3high neutrophil subset. We included 81 PR3-ANCA–positive WG patients. At the time of mPR3 phenotyping, 66 of the 81 patients had a positive ANCA test. The diagnosis was made on the basis of the criteria of the Chapel Hill Consensus Conference (19) and the American College of Rheumatology (20). PR3-ANCA was assayed by indirect immunofluorescence on ethanol-fixed neutrophils and by PR3-specific enzyme-linked immunoadsorbent assay. Relapse was defined as a rapid rise in creatinine levels accompanied by urinary sediment activity, the detection of active vasculitis, or glomerulonephritis; pulmonary hemorrhage or expanding nodules; the observation of iritis or uveitis; or new mononeuritis multiplex. Relapse occurred in 53% of the patients. A total of 154 healthy subjects were assayed for mPR3 expression and served as control. Recombinant TNF-α was obtained from Genzyme (Rüsselsheim, Germany). The monoclonal mouse antibody to PR3 was obtained from CLB (Amsterdam, Netherlands), and FITC-conjugated F(ab)-fragment of goat anti-mouse IgG was from DAKO (Hamburg, Germany). Dextran was purchased from Amersham Pharmacia (Amsterdam, Netherlands). HBSS, PBS, and trypan blue were from Seromed (Berlin, Germany). Histopaque 1083 was obtained from Sigma-Aldrich (Deisenhofen, Germany). The following antibodies were used: CD11b (FITC-conjugated) and CD66b (FITC-conjugated) both from Immunotech (Krefeld, Germany) and CD35 (FITC-conjugated) from Cymbus Biotech (Hants, UK). Endotoxin-free reagents and plastic disposables were used in all experiments. Neutrophils from healthy volunteers were isolated from heparinized whole blood by red blood cell sedimentation with dextran 1%, followed by Ficoll-Hypaque density gradient centrifugation and hypotonic erythrocyte lyses. Neutrophils were centrifuged (10 min at 1050 rpm) and resuspended in HBSS with calcium and magnesium (HBSS2+). The cell viability was detected by trypan blue exclusion and exceeded 99%. The neutrophil percentage in the suspension was >95% by Wright-Giemsa staining. Granulocytes were obtained from CD34+ stem cells of cord blood from two different donors and from peripheral blood of three different healthy volunteers by using a two-step amplification/differentiation protocol. CD34+ cells were isolated using the MACS system (Miltenyi Biotec, Bergisch-Gladbach, Germany). In brief, mononuclear cells were recovered by Ficoll-Hypaque gradient centrifugation (density 1.077 g/ml) and incubated with FcR blocking reagent and hapten-conjugated anti-CD34 antibody (15 min, 4°C). Cells were washed and reacted with microbeads conjugated to antihapten antibody (15 min, 4°C). CD34+ cells were obtained by two cycles of immunomagnetic bead selection, and selected cells were analyzed by flow cytometry. Purity was 83 to 90%. CD34+ cells (0.3 to 0.5 × 106 cells/ml) were cultured in StemSpan serum-free medium (StemCell Technologies Inc., Vancouver, BC, Canada) with 100 ng/ml stem cell factor, 50 ng/ml Flt3 ligand, 20 ng/ml thrombopoietin, and 10 ng/ml hyper–IL-6. Growth factors were added every 2 d, and cells were maintained at 1 × 106 cells/ml cell density. Cell numbers were determined at regular time intervals with an electronic cell counter device (CASY1; Schärfe Systems, Reutlingen, Germany). After 10 to 14 d of culture, progenitor cells were induced to differentiate into neutrophils in RPMI medium supplemented with 10% FCS, 2 mM l-glutamine, 0.1 mM 2-mercaptoethanol, 100 U/ml penicillin and streptomycin (Life Technologies-BRL), and 10 ng/ml G-CSF for 16 d (1 × 106 cells/ml). Every 2 d, growth factors were added and cells were maintained at 1 × 106 cells/ml cell density. After differentiation into neutrophils, duplicate samples were used for all further assays. Stem cell factor and thrombopoietin were from Amgen (Thousand Oaks, CA), and Flt3 ligand and G-CSF was from PeproTech (London, UK). Hyper–IL-6 was produced in yeast as described previously (21). FACS was used as described previously to evaluate the expression of surface molecules on neutrophils (18). Briefly, cells were spun down at 200 × g for 7 min at 4°C. Pellets were resuspended in HBSS without Ca2+/Mg2+ before they were incubated with dilutions of the indicated antibodies. In case the primary antibodies were not FITC conjugated, we used a secondary FITC-conjugated F(ab)2 fragment of goat anti-mouse IgG. Flow cytometry was performed on the same day using a FACScan (Becton Dickinson, Heidelberg, Germany), and 10,000 events per sample were collected. Human IgG was prepared from one patient with biopsy-proven WG (PR3-ANCA) as well as from one healthy donor as described previously (18). Plasma samples were obtained from freshly drawn blood and kept at −20°C. Plasma was filtered through a 0.2-μm syringe filter (Gelman Sciences, Ann Arbor, MI) and applied to a HiTrap protein G affinity column (Pharmacia, Uppsala, Sweden). Bound IgG was eluted with 0.1 M glycine-HCl buffer (pH 2.75; elution buffer). After the antibodies emerged, the pH was immediately adjusted to pH 7.0 using 1 M Tris-HCl (pH 9.0). A mouse mAb to myeloperoxidase (MPO; MPO-7, IgG1) and an isotype-matched control (IgG1) were purchased from Dako (Hamburg, Germany). Before use, IgG preparations were centrifuged at 10,000 × g for 5 min to remove aggregates. Cells were lysed with 20 μl of ice-cold lysing buffer (20 mM Tris-HCl [pH 8.0] that contained 138 mM NaCl, 1% Triton X-100, 2 mM EDTA, 10% glycerol, 0.2 mM sodium orthovanadate, 1 mM PMSF, 10 μg/ml aprotinin, 10 μg/ml leupeptin, 0.1 mM quercetin, and 5 mM Iodoacetamide). Samples were kept on ice for 5 min, supernatant was recovered by centrifugation at 13,000 × g for 5 min at 4°C, and protein concentration was measured by BCA protein assay (Pierce, Munich, Germany). Loading buffer (250 mM Tris-HCL [pH 6.8] with 4% SDS, 20% glycerol, and 0.01% bromphenol blue) was added, and samples were heated for 5 min at 95°C. Each sample that contained 5 μg of protein per lane was loaded on 15% SDS-polyacrylamide gel, electrophoresed, and transferred to nitrocellulose membranes. The membranes were blocked in TBS-T + nonfat dry milk 10% for 1 h and incubated overnight with an antibody to PR3 (gift from Wieslab AB, Lund, Sweden; 1:2000 dilution) in TBS-T + nonfat dry milk 1%. Membranes were washed and incubated with a secondary antibodies (horseradish peroxidase–labeled donkey anti-rabbit IgG [1:5000]; Amersham). Blot was developed by incubation in a chemiluminescence substrate (ECL; Amersham) and exposed to x-ray film. Superoxide was measured using the assay of SOD-inhibitable reduction of ferricytochrome C as described by Pick and Mizel (22). Briefly, neutrophils were pretreated with 5 μg/ml cytochalasin B for 15 min at 4°C. Cells (0.75 × 106) were primed with 2 ng/ml TNF-α for 15 min at 37°C before human ANCA preparations were added. No priming was performed when cells were stimulated with PMA. The final concentrations were 125 μg/ml for purified IgG preparations and 25 ng/ml of PMA. All experiments were set up in duplicate. The samples were incubated in 96-well plates at 37°C for up to 45 min, and the absorption of samples with and without 300 U/ml SOD was scanned repetitively at 550 nm using a Microplate Autoreader. The final ferricytochrome C concentration was 50 μM, and the final cell concentration was 0.75 × 106/ml. Cytocentrifuge preparations of cells were fixed in 100% methanol and stained using modified Wright-Giemsa stain. Cells were assessed by light microscopy. Results are given as mean ± SD. Comparisons were made by t test or Mann-Whitney U test as appropriate. Nonparametric correlation (Spearman) was used to test for a coherence of mPR3 expression with other known variables. Results are given as a correlation coefficient with their corresponding P values. Patient data were collected in a Filemaker database. The demographic characteristics at the time of presentation are listed in Table 1. We studied neutrophil mPR3 expression in 81 PR3-ANCA–positive WG patients and 154 healthy control subjects (Figure 1). The data confirm our earlier observations obtained in a smaller cohort of 35 WG patients. They demonstrate that the percentage of mPR3-positive neutrophils is skewed rightward in patients, compared with control subjects (P < 0.0001). Sixty-seven percent of the patients were analyzed during remission (Birmingham Vasculitis Activity Score [BVAS] 0), whereas 33% of the patients had active disease (mean BVAS 17). We analyzed 10 patients on two occasions, five during both active (mean BVAS 9.8) and inactive disease (BVAS 0) and five additional patients at two different time points, both during inactive disease (BVAS 0). The percentage of mPR3 expression was similar in any given patient regardless of the disease activity. The five patients with active disease had 77 ± 18.3% (SD) of mPR3-positive neutrophils. When they were retested during remission, their mPR3 expression was still 77 ± 10.1%. The five patients in remission, who were tested twice, had 84 ± 13.7% mPR3 expression at the first measurement and 84 ± 14.4% at the second time point. In contrast to the percentage of mPR3 positive neutrophils, the amount of mPR3 expressed showed a trend toward higher expression during active disease (mean fluorescence intensity for mPR3 in remission 222.4 ± 87.7 versus 276.6 ± 122 in active disease; n = 5; NS). 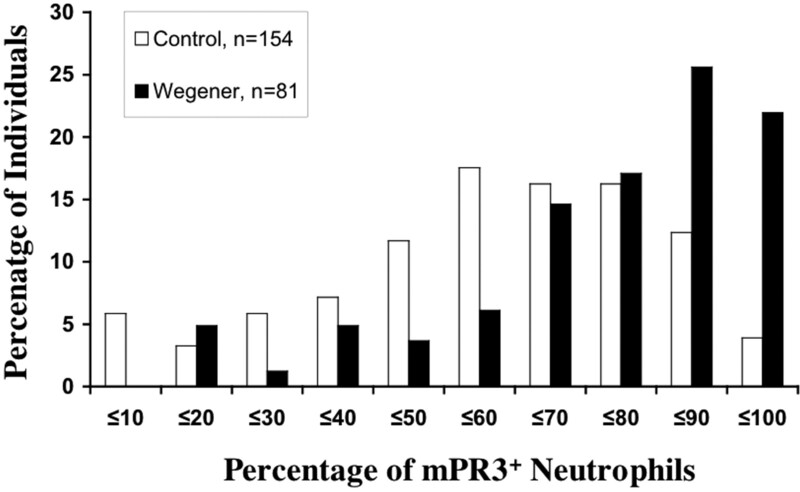 Distribution of the percentage of membrane proteinase 3–positive neutrophils (mPR3high) in a cohort of 154 healthy German subjects compared with 81 patients with Wegener’s granulomatosis (WG). Isolated neutrophils were stained with an mAb against PR3, a secondary FITC-conjugated goat anti-mouse antibody, and analyzed by flow cytometry. □, percentage of mPR3high neutrophils from healthy individuals; ▪, percentage of mPR3high neutrophils from WG patients. We then analyzed mPR3 expression in relation to clinical and laboratory findings at presentation and during the course of the disease in the cohort. Table 2 shows a selection of parameters that were studied at presentation and their correlation with the percentage of PR3high neutrophils. We found that WG patients who had a higher PR3high subset presented with higher creatinine, lower creatinine clearance as estimated by the Cockroft formula, higher C-reactive protein, lower albumin, and more severe anemia. In addition, 18 patients initially required renal replacement therapy. These 18 individuals showed a significant higher mPR3high neutrophil percentage, compared with the 63 patients without the need for dialysis (86.6 ± 11.4 versus 69.3 ± 22.7% mPR3high neutrophils; P < 0.001). Furthermore, we observed a strong trend toward higher BVAS (P = 0.051). No such correlation was observed, for example, for thrombocytes, leukocytes, and total protein concentration. We next assessed the percentage of mPR3high subset and follow-up parameters. Patients were followed for a mean of 79 ± 55 mo. We observed relapsing disease in 44 of 81 WG patients. Fifteen patients experienced one relapse, 17 patients had two relapses, and 12 patients had more than two relapses. We found no correlation between relapse number and percentage of PR3high neutrophils. In addition, no significant correlation was found with regard to time intervals to relapse and to BVAS at relapse. We did find, however, a significant positive correlation between the percentage of PR3high neutrophils and creatinine up to 5 yr and a negative correlation with the calculated GFR up to 6 yr of follow-up. We had shown previously that the percentage of PR3high neutrophil subset is stable in a given individual and, using a twin approach, that the mPR3 expression phenotype is genetically determined (16). To gain further insight into the regulation of mPR3 expression, we explored the possibility that CD34+ hematopoietic stem cells from umbilical cord could be differentiated into functional neutrophils and asked whether these stem cells were equipped with the information to generate an mPR3low and mPR3high neutrophil subset. Human umbilical cord CD34+ stem cells were amplified followed by neutrophilic differentiation with G-CSF. Wright-Giemsa staining demonstrated progressive neutrophilic differentiation after 4 d (Figure 2). At day 14, the majority of neutrophils had the typical size and nuclear morphology of mature neutrophils. Differentiation of CD34+ hematopoietic stem cells with G-CSF. Expanded CD34+ cells at day 0 and after 4 and 14 d of treatment with G-CSF were cytospun and stained with Wright-Giemsa. Microscopy indicates the progressive appearance of cells with morphologic signs of neutrophilic maturation. A typical of two independent experiments is depicted. Magnification, ×40 in left images; ×100 in right images. In addition to morphologic characteristics of neutrophils, G-CSF–differentiated CD34+ stem cells progressively expressed the neutrophil marker CD66b. 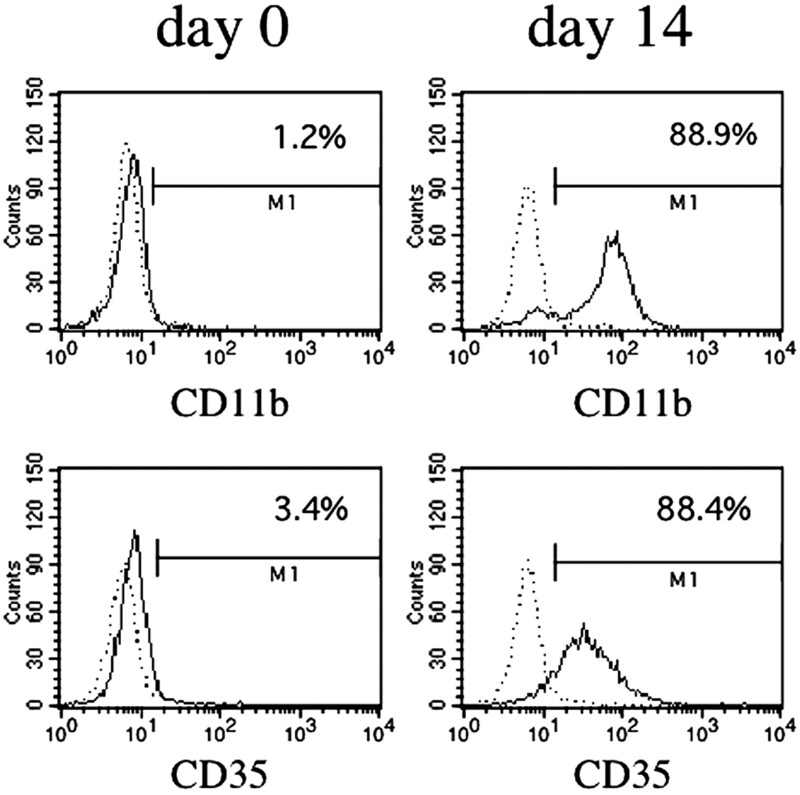 Figure 3 shows increasing expression of membrane CD66b with a small percentage of CD66b-positive cells at day 0 and 87.9 ± 1% at day 14 (n = 2). Flow cytometry analysis revealed that G-CSF treatment resulted in increased expression of additional neutrophilic molecules such as β2-integrins (CD11b) and CD35, a marker of secretory vesicles (Figure 4). Whereas a negligible percentage of cells stained positive for the respective marker at day 0, nearly 90% of the cells expressed these molecules after 14 d of neutrophilic differentiation by G-CSF. Membrane expression of CD66b on CD34+ hematopoietic stem cells that were treated with G-CSF. Flow cytometry of cells that were stained with a FITC-conjugated mAb to CD66b or an isotype control was performed at the indicated time points. Treatment with G-CSF resulted in progressive expression of CD66b. A typical of two independent experiments is shown. Membrane expression of CD11b and CD35 in CD34+ hematopoietic stem cells that were treated with G-CSF. Flow cytometry of cells that were stained with a FITC-conjugated specific antibodies or an isotype control was performed. The data demonstrate no CD11b and CD35 expression in undifferentiated CD34+ cells. In contrast, nearly 90% of the cells became positive after 14 d of treatment with G-CSF. A typical of two independent experiments is depicted. Neutrophils from the myelocyte stage on respond to various stimuli with activation of the NADPH oxidase system. We tested the ability of neutrophils that were differentiated from CD34+ cells to generate superoxide upon stimulation with PMA (Figure 5). CD34+ cells that were incubated in buffer control alone did not generate superoxide at day 0 or at day 14 of G-CSF treatment. In contrast, PMA did trigger a strong respiratory burst in cells that were treated with G-CSF for 14 d (37 ± 4 nmol) but had no effect on undifferentiated CD34+ cells (3.0 ± 0 nmol O2−/7.5 × 105 cells per 45 min). Taken together, these data indicate that G-CSF induces fully functional neutrophil differentiation from CD34+ cells. Respiratory burst activity in CD34+ hematopoietic stem cells before and 14 d after treatment with G-CSF. Superoxide was measured with the ferricytochrome C assay, and data from the 45-min time point are depicted. These experiments demonstrate that PMA triggered respiratory burst activity in G-CSF–differentiated neutrophils but not in undifferentiated CD34+ stem cells (n = 2). Left, cells were treated without PMA; right, cells were treated with PMA. We next studied whether the information to generate an mPR3low and mPR3high subset resides already within the human stem cell. Assaying intracellular PR3 by Western blot (Figure 6) and by intracellular flow cytometry (data not shown), we found only very small amounts of PR3 in undifferentiated cells. In contrast, PR3 was clearly detectable in G-CSF–treated CD34+ cells from day 4. We found no PR3 on the membrane of undifferentiated hematopoietic stem cells (Figure 7). However, differentiation with G-CSF resulted in an mPR3high and an mPR3low subset of cells. At day 14 of differentiation, 13% of mPR3-positive cells in experiment 1 and at 38% in experiment 2 were detected. No further increase was observed up to day 16, when the experiments were stopped. Intracellular PR3 content was compared by immunoblotting. Jurkat cells (Ju) that do not express PR3 served as negative control and human neutrophils (PMN) as positive control. CD34+ stem cells were differentiated with G-CSF and subjected to immunoblotting for PR3 after 0, 4, 10, and 14 d of treatment. The experiments indicate that significant intracellular amounts of PR3 were detected in CD34+ stem cells after 4 d of G-CSF treatment. A typical of two independent experiments is depicted. Membrane PR3 expression was studied by flow cytometry. CD34+ hematopoietic stem cells were stained with an mAb to PR3 before and after 4 and 14 d of G-CSF treatment. The data demonstrate that differentiation of CD34+ cells with G-CSF resulted in two distinct mPR3-expressing populations. An mPR3low and an mPR3high subset can be distinguished. Data from one representative experiment are shown. Finally, the ability of stem cell–derived neutrophils to respond to PR3-ANCA was tested. Because of the limited cell number, we used in both experiments an IgG preparation of one PR3-ANCA patient and one control subject. Stimulation of TNF-α–primed hematopoietic progenitor cell–derived neutrophils with 125 μg/ml PR3-ANCA resulted in 23 ± 12 nmol O2−/45 min at day 14, whereas control IgG triggered only 14 ± 14 nmol O2− (n = 2). In the second experiment, we stimulated the differentiated neutrophils in addition to the human preparation with an activating mAb to MPO. A total of 10 μg/ml of the mAb to MPO resulted in 34 nmol O2−/45 min compared with 10 nmol O2− in TNF-α–primed cells that were incubated with an isotype control. These very preliminary data suggest that stem cell–derived neutrophils could respond to PR3- and MPO-ANCA. This observation supports the contention that CD34+ cell–derived neutrophils may be used for studying both mechanisms of membrane PR3 expression and ANCA-induced activation. The important findings in our study are that patients with a higher percentage of mPR3high neutrophils showed significantly higher creatinine and C-reactive protein values and lower albumin and GFR determinations at presentation. Along the same lines, patients who initially required dialysis had a significantly higher percentage of mPR3high neutrophils compared with those without severe renal failure. We also observed a strong trend toward a higher BVAS; however, this tendency did not quite achieve significance. In addition, analysis of creatinine and GFR during follow-up revealed that the course of renal function was worse in patients with a higher percentage of mPR3high neutrophils. This finding has not yet been reported. These data extend those of an earlier report (15). Because mPR3 expression seems pivotal and genetically determined, we next differentiated human CD34+ progenitor cells to neutrophils. We showed that this differentiation is possible, also in humans. We also found that the differentiated cells not only exhibit mPR3 but also display the same bimodal distribution as found in humans with or without disease. ANCA are pathogenic in animal models and activate in vitro cytokine-primed neutrophils that express ANCA antigens (4,5,8,10,11,23–26). Neutrophil priming mobilizes PR3, the WG autoantigen, from its intracellular stores, resulting in an increased membrane expression. However, resting neutrophils also express PR3 on the outer cell membrane. On the basis of this mPR3 expression pattern, neutrophils can be divided into an mPR3high and an mPR3low subset. This bimodal expression pattern is stable in a given individual, does not change with cell activation, and is genetically determined (15–17). Other investigators and our own group demonstrated that a large percentage of mPR3high neutrophils provides a risk factor for WG (15–17). We investigated the correlation between a large mPR3high subset and the clinical and laboratory disease manifestation in a cohort of 81 WG patients. In addition, we examined the feasibility of generating human neutrophils from CD34+ hematopoietic stem cells and tested the hypothesis that these stem cells differentiate into an mPR3high and an mPR3low subset. Recently, we presented data showing that mPR3high neutrophils respond to PR3-ANCA, but not to other stimuli, with increased phosphatidylinositol 3 kinase/Akt signaling and respiratory burst activation (18). This observation provides one of probably several explanations as to why a large percentage of mPR3high neutrophils are a risk factor for WG. Rarok et al. (15) analyzed 89 WG patients and found that a high percentage of mPR3-expressing neutrophils was significantly associated with an increase in relapses. In their study, no association with specific clinical manifestations was detected. Our results extend the observations from the Dutch cohort. Our data are also in agreement with published results from other studies, showing that the renal function at initial presentation is the best predictor for renal function at follow-up (27–29). However, in contrast to the Dutch study, no significant correlation with the relapse risk was found in our cohort. One difference between our study and the Rarok data is that we observed different mPR3 expression patterns. In the Dutch cohort, only 30% of the patients and a similar percentage of control subjects showed a bimodal mPR3 expression pattern. We do not know the explanation for this difference between the German and the Dutch cohorts. However, in a study of French patients, Witko-Sarsat et al. (17) found an mPR3 expression pattern that was very similar to our cohort. The clinical data obtained from our study support the contention that the mPR3 expression pattern is correlated with clinical parameters at presentation of WG and, moreover, affects renal outcome. Increased interaction of ANCA with mPR3high neutrophils resulting in stronger cell activation, as found in our previous in vitro experiments, may provide some explanation for these important clinical findings (18). However, whereas increased amounts of PR3 on neutrophils in active ANCA disease were shown, ANCA bound to neutrophils has not yet been demonstrated in vivo. The latter state of affairs could have several explanations, including low-affinity nature of the antibodies (30), technical difficulties to detect membrane-bound ANCA, clearing of ANCA-coated polymorphonuclear leukocytes (PMN) from circulation, or the possibility that binding of ANCA to PMN occurs only in the microcirculation after neutrophils have been primed by inflammatory cytokines (31). The significance of a large mPR3high neutrophil percentage subset for clinical manifestations and outcome in WG patients underscores the need to understand better the mechanisms that determine the mPR3 expression pattern. Because neutrophils have a very limited life span and are hard to transfect, studies on mechanisms that control mPR3 expression are difficult. We showed previously that genetic factors have a strong influence. However, we still do not know whether the information for the membrane expression lies in the differentiating hematopoietic stem cell itself or in the body’s environment. For that reason, we tested the feasibility of alternative models to study mechanisms of mPR3 expression, such as the use of stem cell–derived neutrophils. Recently, Lieber et al. (32) demonstrated the in vitro production of neutrophils from mouse embryonic stem cells. These investigators generated functional murine neutrophils. Conceivably, this technique would have utility for studies with genetically manipulated mice. We showed that human CD34+ hematopoietic stem cells could also be expanded and differentiated into fully functional neutrophils in vitro. The resulting G-CSF–differentiated cells show the typical neutrophil morphology, express characteristic surface molecules, and can be activated as shown by respiratory burst activity. CD66b expression begins at the pro-myelocytic stage, CD11b begins at the myelocytic stage, whereas CD35 is detectable only in bands and segmented granulocytes. Thus, the expression of the surface markers assayed in this study established that our differentiation protocol resulted in approximately 90% mature (CD35+) neutrophils (33). This two-step system follows the natural pathway of neutrophil differentiation from hematopoietic stem cells and provides an interesting new opportunity to study cell differentiation, signaling pathways, and biologic functions in human neutrophils. Modern techniques such as si-RNA and other methods to manipulate gene expression that are inherently difficult to apply to neutrophils may now become feasible to address other questions in this cell type. Because we are interested in mechanisms that determine mPR3 expression, we monitored mPR3 expression in CD34+ progenitor cells, which has not been studied before in any stem cell line. Our data clearly indicate that during neutrophil differentiation from stem cells, mPR3 expression is increased until a stable level is achieved. However, some cells persistently remained mPR3 negative, resulting in a bimodal mPR3 pattern similar to what is observed in neutrophils that are isolated from the circulation of human donors. This result suggests that stem cells contain the genetic information to generate both mPR3low and mPR3high neutrophil subsets. Targeting candidate molecules that may be involved in membrane insertion, such as SNARE by si-RNA, may gain new insight into mechanisms that control mPR3 expression and should be explored in future studies. To understand better this bimodal expression type of mPR3, we would have liked to compare membrane expression of the differentiated neutrophils with the mPR3 expression of the stem cell donor. Unfortunately, various restrictions made such a study impossible. Therefore, we tried a different approach and differentiated neutrophils from CD34+ hematopoietic stem cells from peripheral blood of three adult donors to compare their mPR3 expression pattern with isolated mature neutrophils from the same person (data not shown). Although the differentiated neutrophils expressed CD66b, no bimodal mPR3 expression pattern that is typical for mature neutrophils isolated from blood was observed. Possibly, adult hematopoietic stem cells that are harvested from the peripheral blood have properties that differ from more immature cord blood stem cells. Earlier studies showed that CD34+ cells from peripheral blood and bone marrow differ significantly in the expression of several cell-surface markers (34). Furthermore, hematopoietic stem cells that are harvested from the peripheral blood or bone marrow have a lower cloning efficiency and proliferative capacity, compared with progenitor cells from cord blood (35). In our experiments, we found a much lower proliferation rate for the progenitor cells that were harvested from peripheral blood. However, we found a faster differentiation in these cells (data not shown). In summary, our data underscore the clinical importance of the mPR3 phenotype in WG patients. Creatinine and GFR during follow-up were worse in patients with a higher percentage of mPR3high neutrophils. We also demonstrated that hematopoietic stem cells could differentiate in vitro into mPR3high and mPR3low neutrophil subsets, indicating that hematopoietic stem cells contain genetic information resulting in a bimodal mPR3 expression pattern of mature neutrophils. This stem cell model may provide a new opportunity to study mechanisms of mPR3 expression. This study was in part supported by InnoRegio 03 i 4509B.